This exhibit depicts the sagittal conditions of the cervical spine with subsequent anterior discectomies and fusion. 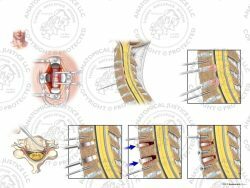 Pre-operatively, disc herniations can be seen from C3-7, with spinal cord compression at C4-7. 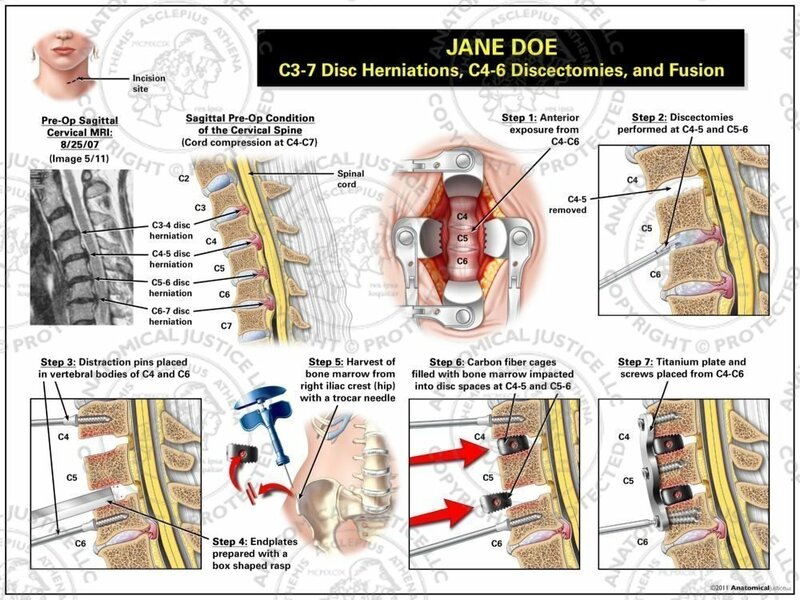 The procedure begins with an anterior incision and exposure from C4-6. Discectomies were performed at C4-6, distraction pins were placed, and the vertebral endplates were rasped to bleeding bone. 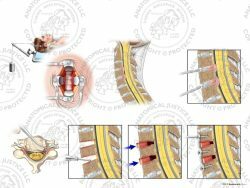 Bone marrow was harvested from the right iliac crest with a trocar needle, and placed into carbon fiber cages. The cages filled with marrow were then impacted into the C4-5 and C5-6 disc spaces. Finally, a titanium plate was placed from C4-6 and secured with screws.